Thank you for purchasing a Dart flyscreen. It has been carefully designed and manufactured to suit a specific motorcycle model and by following these instructions you should encounter no problems with fitting. Fit the grommets to the screen - this is best achieved from the back of the screen blade. Fit the rubber collets into the four clamp components, ensuring they fit snugly. Push the steel brackets onto the PlusMount clamp as per the diagram, add the anodised aluminium discs and secure with the M8 x 16mm countersunk screws. Tighten these fully. Place the clamps on the fork legs, a little below the top yoke and secure with the four M6 x 16mm screws. Don’t tighten these fully yet. With both brackets fixed, hold the screen blade in position and fit the hexagon head machine screws with their washers, ensuring that they engage in the captive nuts on the brackets. Do not tighten these yet. Now everything is in position, you can adjust the height of the screen above the headlight to your satisfaction, and make sure it’s good and central. Then gradually tighten the PlusMount clamp screws until there is the smallest of gaps between the two clamp halves. Now tighten the screen screws until they seat on the brackets. Double check that everything is sufficiently tight and if so, fitting is now complete! MAINTENANCE: No special maintenance is required. Do not use solvents to clean - just warm soapy water. Many proprietary glass cleaners are suitable for polycarbonate - check the label before trying. IMPORTANT NOTICE: Whilst the screen provides a good level of impact protection, it is not warranted unbreakable. 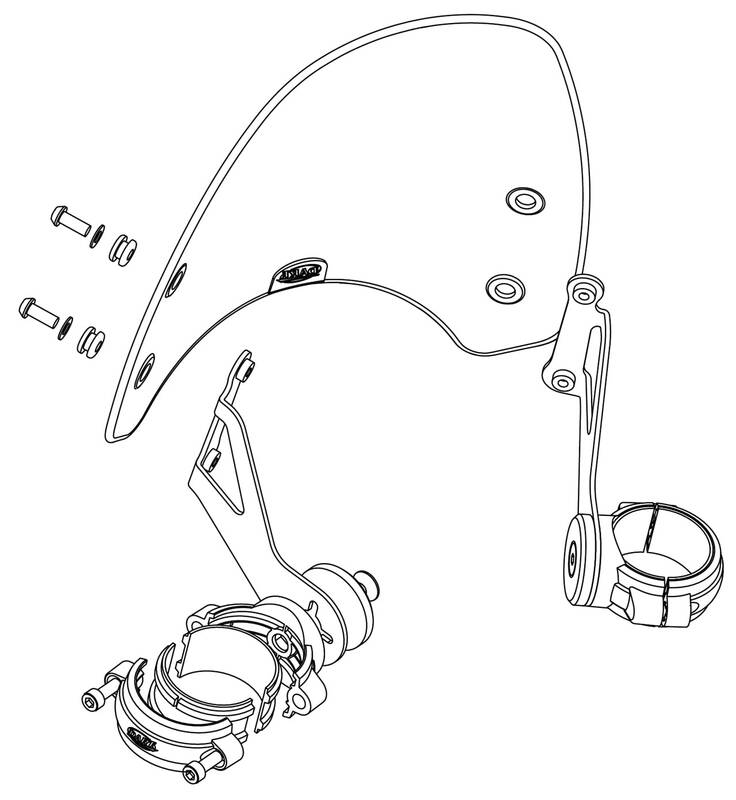 It is NOT a substitute for eye protection, which should be worn at all times while riding.